Contractor Websites & Internet Marketing - SEO Contractor marketing and contractor websites for electricians, plumbers, HVAC contractors. SEO For Websites. Hi, I’m Kim Hopkins, owner of Happy Contractor. 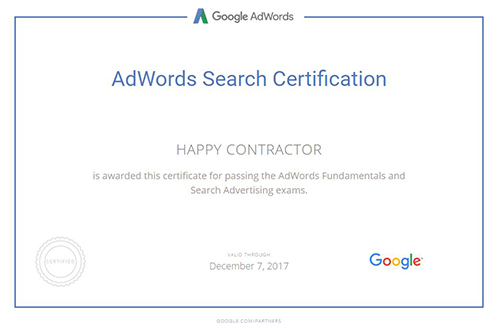 I started Happy Contractor to provide contractors with a way to inexpensively and easily get more customers from the Internet. Happy Contractor builds websites for contractors and pushes them to the top of the Internet search engines where customers will see them. With over 30 years of experience as contractors ourselves, and 15 years of experience in Internet marketing, we understand the needs of our contractor clients and of their customers. I started as an electrical contractor in Los Angeles in 1979. In those days, the Yellow Pages were the major source of new customers for contractors. As many contractors experienced, the prices of Yellow Page ads inflated over the years. Eventually, I was paying tens of thousands of dollars a year, yet getting fewer and fewer customer calls. In 1995, when customers started looking for contractors on the Internet, I built my company a website. Each year, the Internet brought us more customers. By 2005, we had discontinued our Yellow Page ads. By 2010, we earned over $600,000 from new Internet customers. Along the way, we started Happy Contractor to provide contractors across the country with websites and Internet marketing. Our clients include, among other types of contractors – plumbers, HVAC contractors, general contractors… and outside of L.A., electricians. Our contracting company in Los Angeles keeps us attuned to how the rapid changes in Internet marketing can be used to the advantage of contractors. When we take you on as a client, we ask about the types of customers and the service areas that you find most profitable. We design or, if needed, re-design, your website based your preferences and on our years of experience with contracting customers. Your website is customized to attract your customers and get them to call you. For clients who want Internet customers immediately, we set up (or revise) and manage Pay-Per-Click campaigns. These are paid ads on Google, Yahoo, or Bing that can bring in customer calls within 24 hours. As ad costs can easily get out-of-hand, we manage your ad campaigns to maximize quality calls to your office and minimize costs. Often we help clients with existing Pay-Per-Click campaigns save thousands of dollars a year in unnecessary charges. Our mission is to use the Internet to generate a steady stream of customers for your company and higher profits for you. Please feel free to give me or any or my staff a call to discuss Internet marketing for your company. We’re always in our office 8-5 Pacific Time M-F at 800-990-5811.